A true gem to start. A hole which is pleasing to the eye and full of adventure. A well placed water hazard is in play from all tee decks. There is lots of room to the right and the bunkers in the distance are the ideal target. A relatively easy uphill second shot to a deceptive green awaits you for your approach shot. The rock wall is the first of many unique features throughout the course. A chance to make a birdie early. A generous par five with lots of room off the tee. The first of many decisions to be made on a course with plenty of risk and reward. The green is protected on the right by a large sand trap that is over 60 yards long. 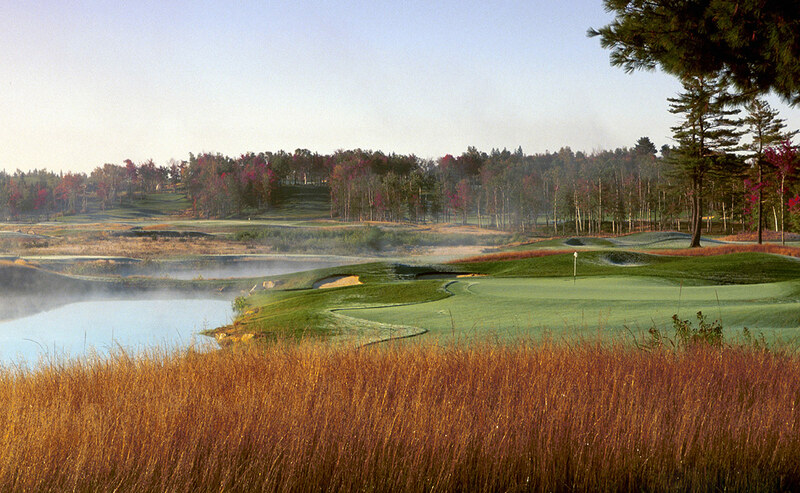 A demanding tee shot with water right and left. The safe shot is to hit a shot to the open fairway away from the water leaving you with a shot to a green protected by bunkers. Long hitters can try to carry the water but risk making a big number if they miss. The first of four difficult par threes. The tee shot is all carry and demands a player to hit a ball high to a narrow green that is difficult to read. Wind can influence club selection dramatically. A straight away par 4 that normally plays into the prevailing wind. The wide fairway is a welcome site but the fescue mounds that outline the hole are not. The well protected green demands an accurate approach shot. A great risk reward hole. A good drive over a pond leaves you with a decision. Going for the green in two calls for a long iron or fairway wood over water to a narrow green. If the ball is dry after your second shot, you stand a good chance for birdie. The safe play is to avoid the water by playing left. A par three that is well protected by bunkers. Club selection is important on this tee considering the hole can vary from 107 yards to 213 yards. Try to stay below the hole to avoid a slippery downhill putt. A great view overlooking the meadow will take your breath away. The big elevation drop makes the hole play shorter than the yardage on the card. 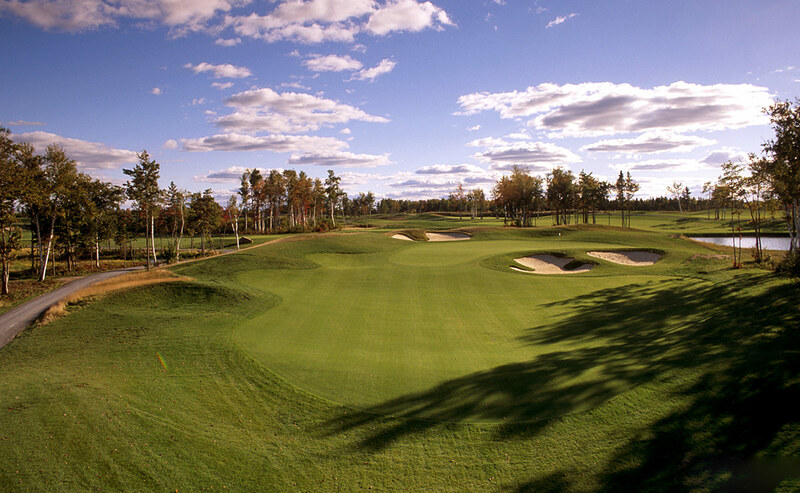 A great chance to hit a big drive with a enormous fairway that is shared with the 15th hole. 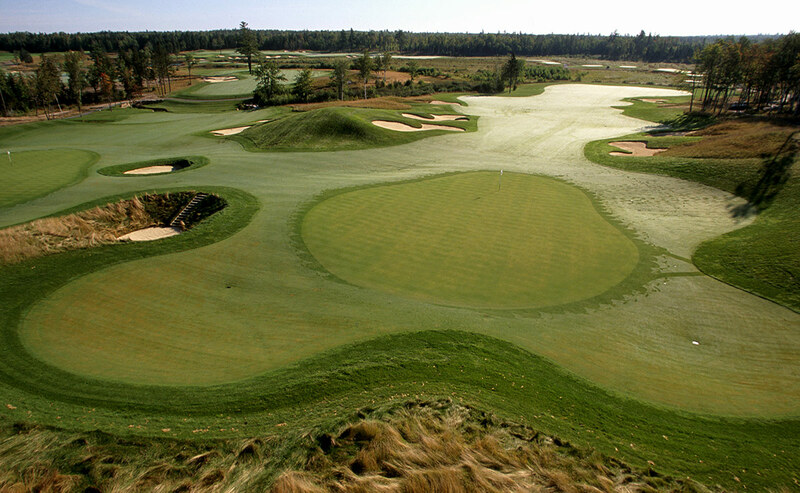 The large fairway does contain some pot bunkers that require steps to access them. The two tiered green is protected by a sod wall bunker that is a must to stay out of. 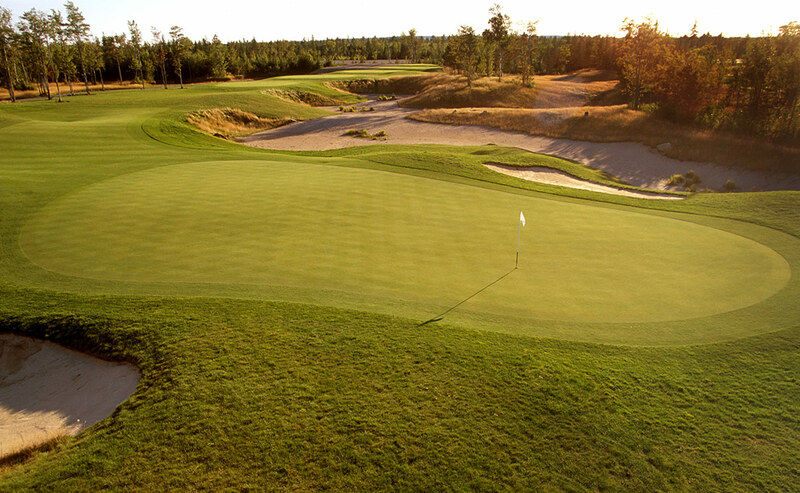 A forced carry over the enviromentally sensitive area is required to take advantage of this shorter par four. 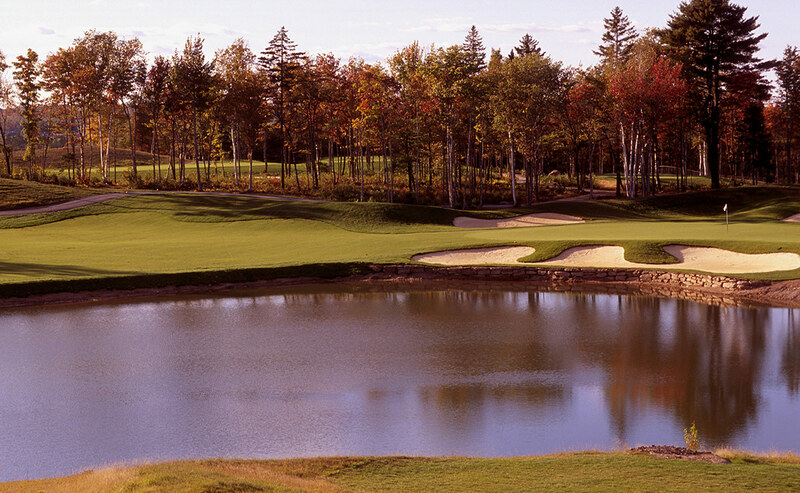 This hole has bunkers up both sides of the fairway to a large green backdropped by the elaborate Kingswood lodge/clubhouse. A low score on the 9th sets you up well for the splendid back nine. A relatively easy par five to start the back nine. Once again, a risk reward tee shot, a drive to the left of the bunkers makes it a 3 shot hole but a good drive over the bunkers allows for an opportunity to hit the elevated green in two. A shot missing the green will test your short game. 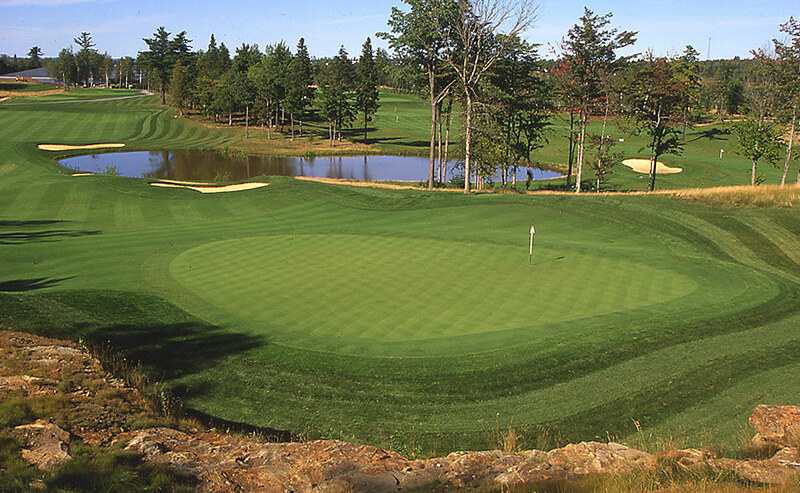 Judging the wind and selecting the proper club are the keys to success on this par three. The well guarded tee makes the wind feel benign but the flag will usually be telling you otherwise. Getting the ball close to the pin requires you to carry the ball over the front bunkers. 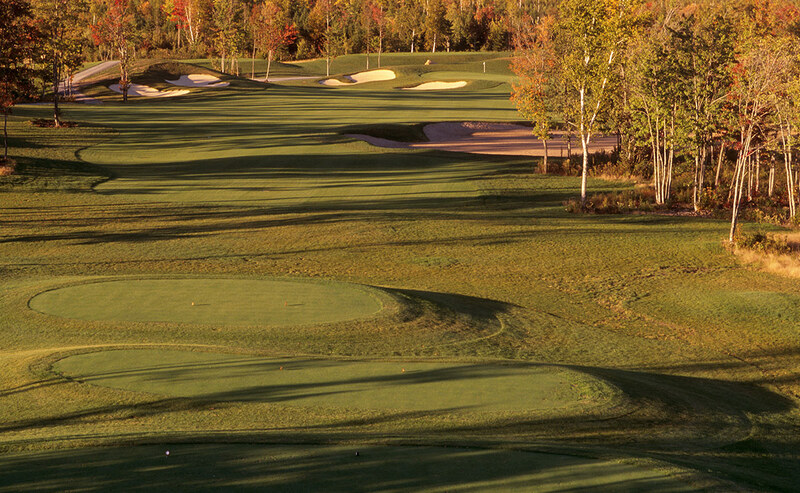 It might be better to be long than short on the most deceptive hole on the course. A wide fairway on this dogleg right hole allows you to swing away. The bunkers in the distance are the ideal target. 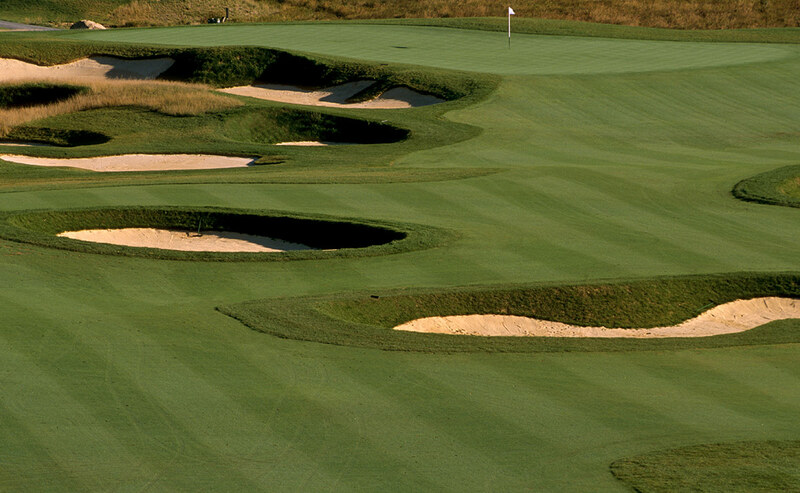 The fescue mounds defining the right side is the only trouble you can get yourself into on this hole. You approach shot to the small two tiered green will set up a good chance at birdie. 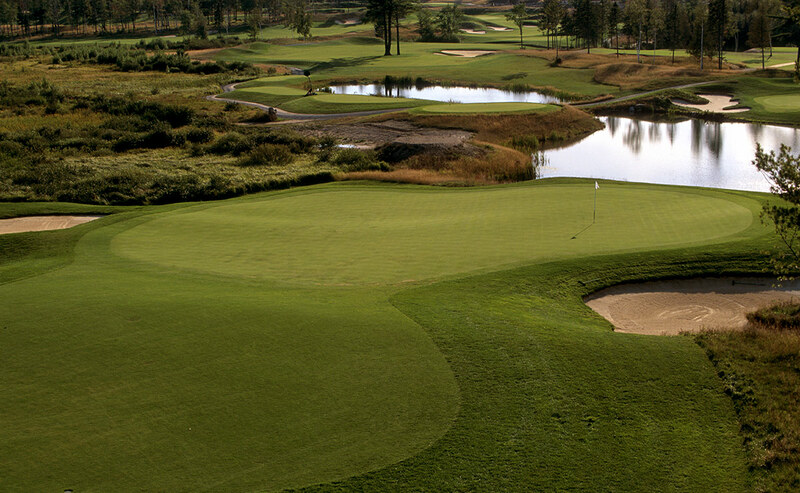 The shortest par four on the course is by no means the easiest. The waste bunker on this hole makes a decision of whether to go for the green or to lay up short an important one. Getting too close to the green off the tee can sometimes make for a harder approach shot to this narrow green. 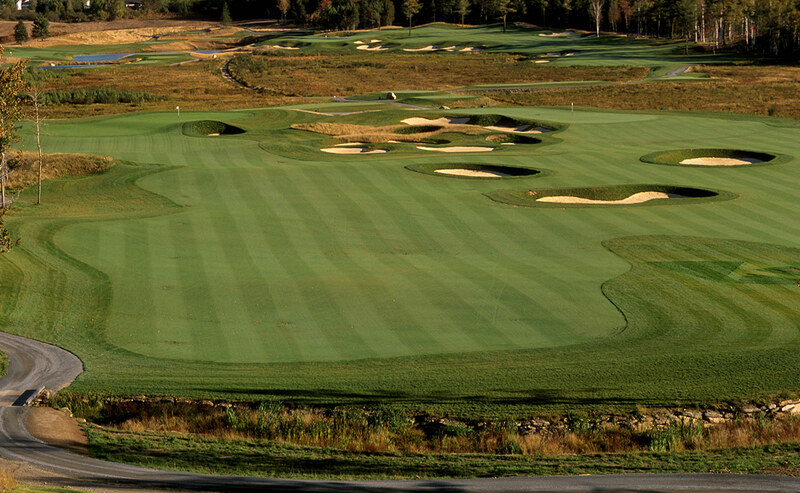 The player who has good distance control has the advantage on this great character par four. 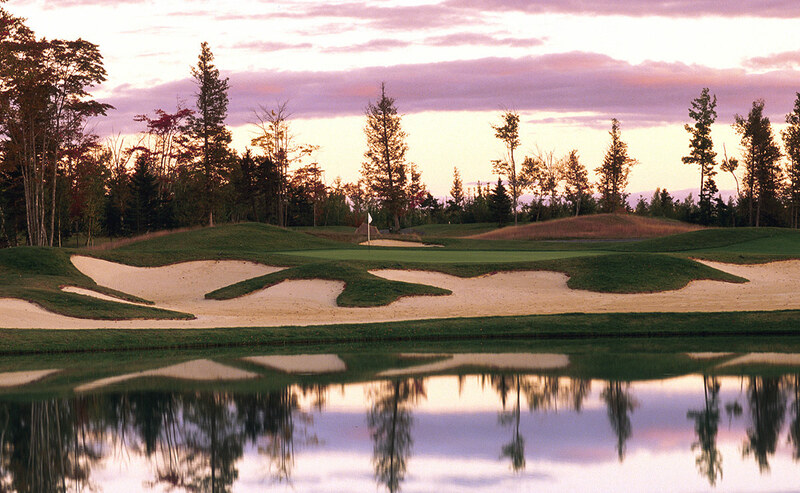 Considered to be one of Canada's greatest holes. The shear beauty of this hole will take your breath away. 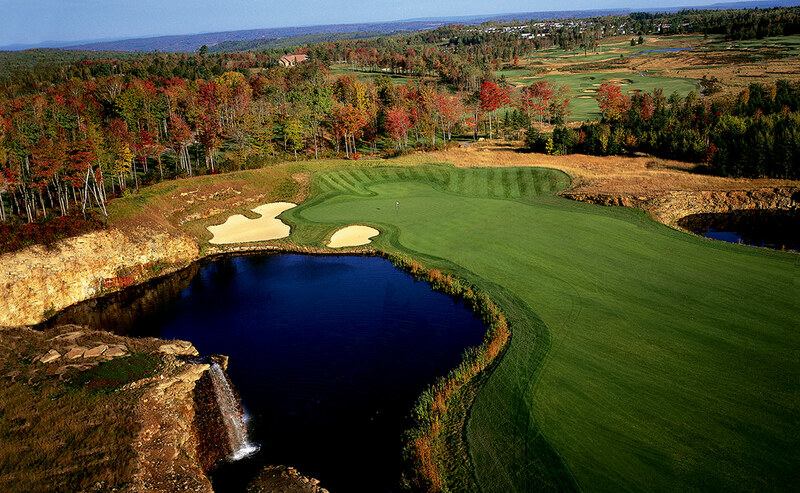 The 30 foot waterfall hightlights this spectacular 435 yard slight dogleg right par four. 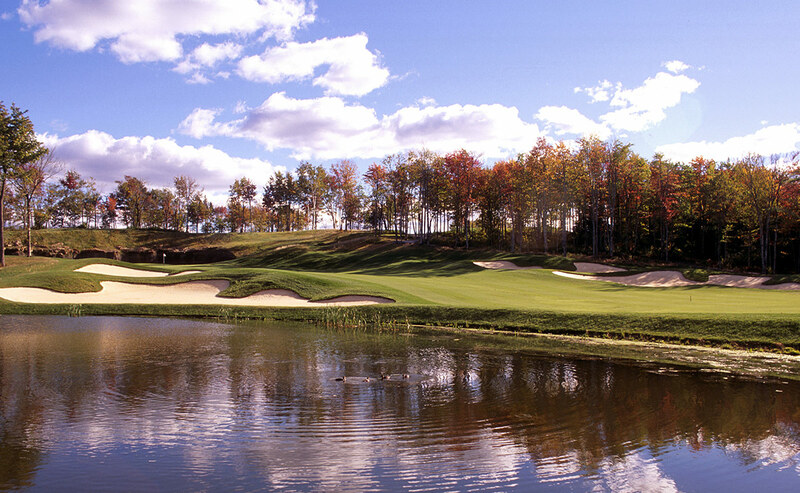 Kingswood's signature hole is one that is not forgotten by any golfers. Another great view overlooking the meadow. A wide open fairway is forgiving but stay away from the pot bunkers. The approach shot into this well guarded green is the key to a good score. There is always the option to play away from the hazards guarding the green to a position which allows for an easy chip shot. 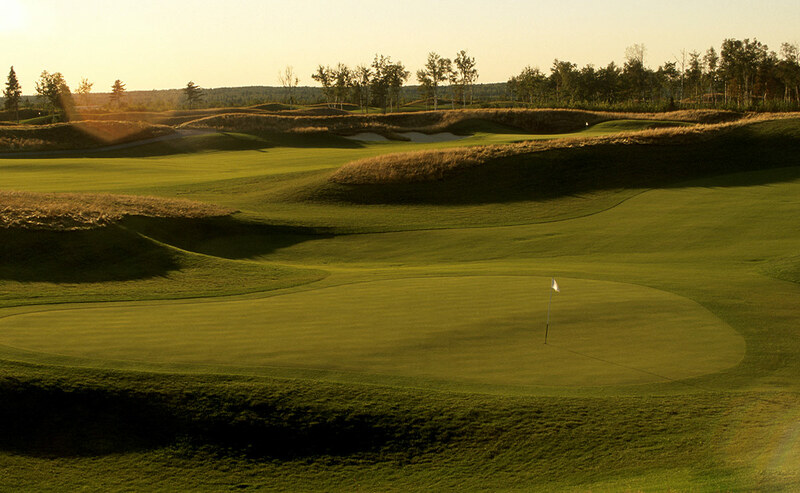 The biggest risk reward hole on the course. The landing area over the environmental sensitive area looks small from the tee but nothing could be further from the truth. You have the option to try and cut off as much you can with your tee shot. A good tee shot gives you a good chance at birdie but a bad shot could result in a double bogey on the last par five you will see. 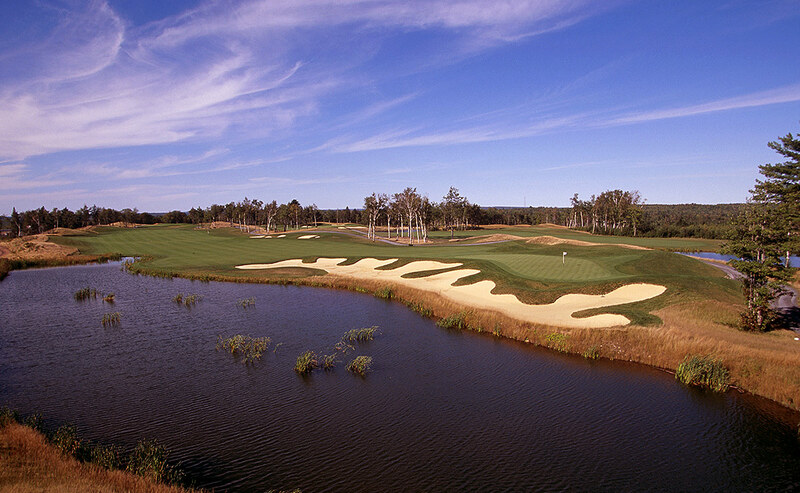 A great par 3 is in the middle of the best three finishing holes you may ever play. The large lake guarding the green is in play for all golfers. The magestic fescue mounds outine the hole like a border around a page. 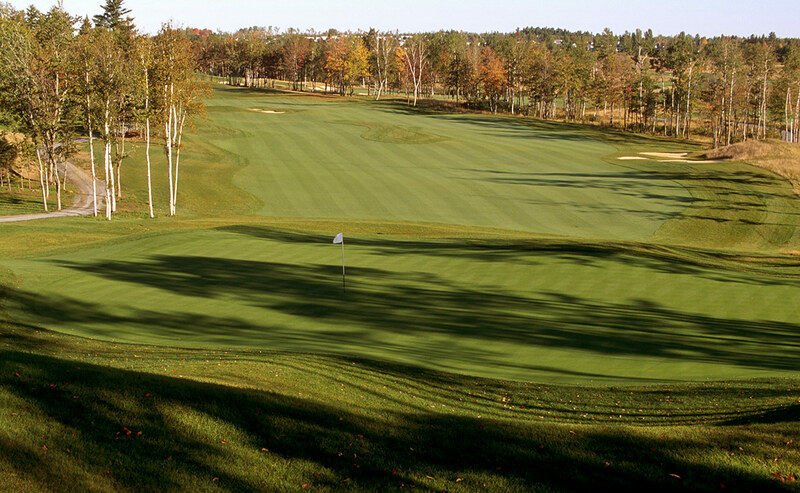 The twin pine trees in the middle of the fairway are sure to be the topic of conversation after your round. 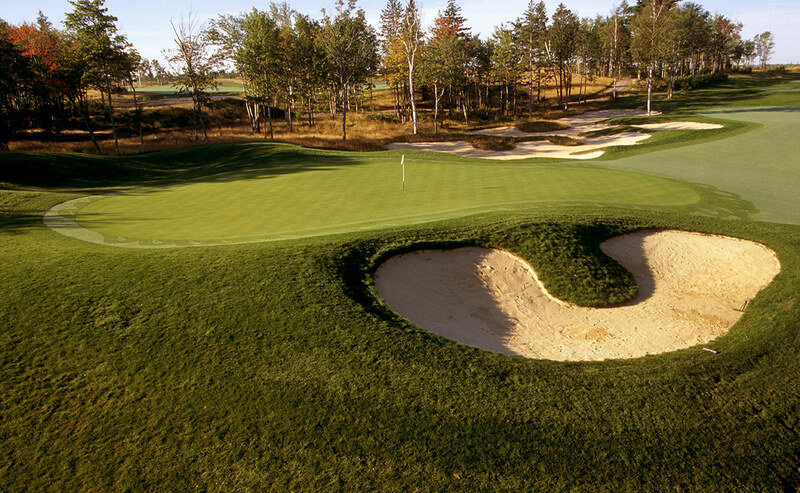 Avoiding the trees and the rightside fairway bunker is the key to scoring well on this long par four. 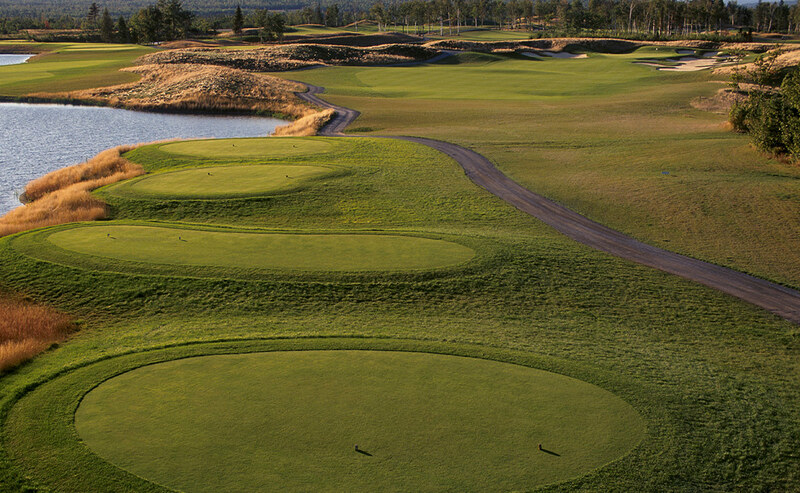 A large green surrounded by stratetically placed sod wall bunkers awaits your appoach shot.